This high-quality sit-stand workstation is designed to help improve posture, energy levels and productivity when working; it is perfect for use at home or in the office. Our flexible workstation riser allows you to stand or sit comfortably while working at your desk. Thanks to the innovative spring-assisted lifting mechanism, the desk will smoothly adjust to 22 different heights in just a few seconds with the built-in dual squeeze latches. 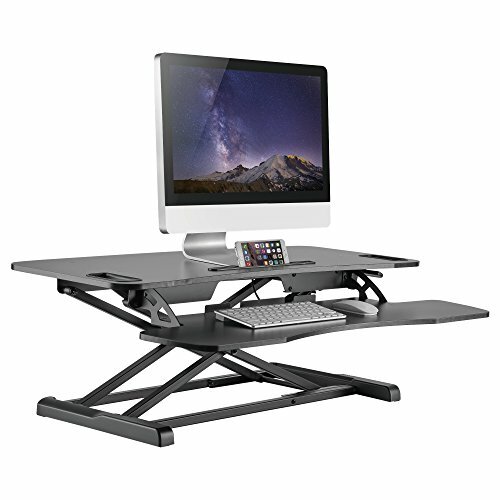 The ergonomic desk stand, with a maximum load capacity of 33 lbs., features a spacious upper platform surface to place your dual-monitor setups or other necessities; the lower deck provides ample space for your keyboard and mouse. Constructed of solid steel with wide MDF tabletop, our sit-stand desk is extremely sturdy and durable. No assembly required, just use straight out of the box, and enjoy the health benefits of standing during your work. Sturdy steel frame with wide MDF tabletop keeps the desk stable and solid even when fully extended; maximum load capacity of 33 lbs. If you have any questions about this product by 1home, contact us by completing and submitting the form below. If you are looking for a specif part number, please include it with your message.